There are currently 2.4 million people in American prisons. This number has grown by 500% in the past 30 years. 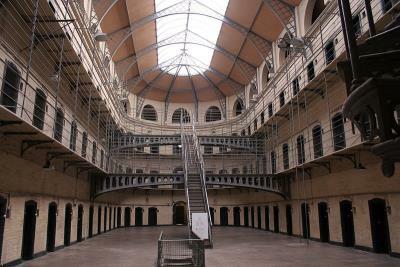 While the United States has only 5% of the world's population, it holds 25 percent of the world's total prisoners. In 2012, one in every 108 adults was in prison or in jail, and one in 28 children in the U.S. had a parent behind bars. Why do we have so many people in prison? 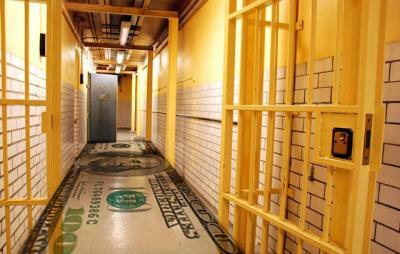 Money is a huge reason we have so many prisoners. Several corporations make huge profits off prisons. It costs an average of $23,876 annually to house a state prisoner for a year. To save money, cash-strapped states (aka, us, the taxpayers) pay companies to deal with their prisoners. Companies make money by running prisons as cheaply as possible and squeezing the prisoners and their families for money for basic necessities and fees. As a result, private prisons are a $70 billion industry. Even crazier, 65 percent of private prison contracts require an occupancy guarantee. That means states must have a certain amount of prisoners -- typically between 80 and 90 percent of occupancy -- or pay companies for empty beds. Talk about bad incentives -- a state throws money away if it does not have enough prisoners. 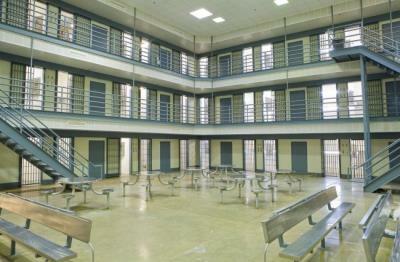 Globel Tel-Link provides phone service to about 57 percent of state prisoners. Their rates are exorbitant. They charge up to $17 for a 15-minute phone call (although the FCC recently voted to limit rates to 25 cents per call for interstate calls). prisoners families' only option is to pay the rate or not speak to their loved one. Here's why that's totally backwards: Studies show that prisoners who are able to maintain a connection with friends and family are less likely to commit crimes while in prison and less likely to end up back in prison after release. Prison phone companies maintain that the high rates are due to their need to keep the lines secure and provide call monitoring. But that's hard to believe when a few companies hold a virtual monopoly on the service and even pay the state a profit based commission. Remember, it's the state that hires these companies. When the state is making money off these phone calls, do you think they are really interested in negotiating a fair, cost-effective phone plan for their prisoners? Corizon makes $1.4 billion a year providing health care in over 530 correctional facilities in 28 states. As a for-profit health care service, their goal is to maximize profits which generally means cutting costs and providing a low quality of care. For example they were recently sued for using licensed vocational nurses to do the jobs of registered nurses, putting patients in danger of receiving inadequate care, but saving Corizon 35 percent per nurse's salary. In order to make higher profits, Corizon denies prisoners drugs and health care, maintains unsanitary practices, refuses to transfer prisoners to hospitals when needed, and provides inadequate mental health screening and care -- just to name a few, of many, examples. In the past five years, Corizon has been sued 660 times for causing deaths and permanent injuries to prisoners in their care. When someone is arrested and arraigned, it can be weeks or even months until their trial date is set. Bail is the most used of the options that judges have to incentivize defendants to return to court for their trials. If the defendant cannot afford to post bail, they must either use a bail bond service or stay in jail to await their trial. America and the Philippines are the only countries in the world that use the bail bond system. In most countries, bail bonds would be considered illegal tampering with justice. This is because bail bond agencies are private companies with a say in whether or not people, who are presumed innocent pre-trial, go to jail. Bail bondsmen can refuse service to whomever they like and charge non-refundable fees. Which means that poorer people are more likely to have to spend time in jail before their guilt or innocence is even determined. For example, let's say that two people (one rich, one poor) are accused of the same crime. Bail is set for $100,000 for each of them. The rich person pays the $100,000, gets out of jail, eventually goes to trial, is found innocent and gets all of his $100,000 back. The poor person doesn't have $100,000. So he can either stay in jail (and probably lose his job and become even poorer), or use a bail bond service. The bond service charges him a non-refundable ten percent fee. So the poor person pays the bail bond service $10,000 (or gets all his friends and family to help him do so), gets out of jail, eventually goes to trial, is found innocent and has lost $10,000 that he will not get back. If someone who has used a bail bond service does not show up for trial, they can be hunted down by a bounty hunter who -- with very little training required -- is authorized to carry guns and pursue suspects without most of the rules that protect interactions between suspects and police officers. Bail companies also lobby for laws that encourage or force judges to set bail more than other options. Bail amounts have climbed over the years, and bail bonds are used in over 40 percent of felony cases. Those in the bail industry say that this allows the government to take the costs of pre-trial services off of the taxpayers, and put it on to private companies. Critics of the system say that not only does it mean that rich citizens spend less time in jail than poor ones, it is also overused. Judges default to bonds in cases where low-risk, first-time offenders, who are unlikely to skip town before trial, could have been offered other pre-trial options that are a small cost to the state. For instance, pre-trial service agencies can tailor the conditions of release to the crime committed (such as breathalyzer monitoring for drunk drivers or a GPS bracelet for someone whose location needs to be monitored), while saving the government costs by reducing the number of people in jail and allowing them to continue to work and contribute to their communities. Asset forfeiture was intended to allow law enforcement to seize assets that had been used to commit a crime -- even if the crime was not committed by the owner of property. Ideally, it would be used in a situation like one where organized criminals use a car to complete drug deals. In addition to arresting the drug dealer, the cops can also seize the car so it cannot be used in any other crimes. It's a little bit unfair because the car owner can be punished despite not actually having committed the crime, but it makes drug crimes harder to commit. Unfortunately, law enforcement takes advantage of asset forfeiture by seizing assets that have not been used to commit a crime. Officers don't have to prove that a crime was committed. They only have to "suspect" it. And once the asset is seized, in some states, it does not have to be returned, even if it has been proven that no crime was committed. In other states, fees to recover property are set so high that even after it has been proven that there was no crime, some owners can't afford the fees associated with getting their property back and must abandon it. Officers have a huge incentive to seize assets that they know weren't used to commit a crime because they often get to keep the assets they seize. Some precincts are so cash-strapped that their budgets depend on asset forfeiture, and there isn't any punishment for seizing assets from innocent citizens. A reporter from the New Yorker investigated Tenaha, Texas, where drivers who haven't committed a crime are routinely forced to surrender their cash or cars during routine traffic stops, and an elderly couple had their home seized after their adult son sold $40 worth of marijuana on their porch without them having any knowledge of the transaction. After John Oliver's segment on asset forfeiture received over four million views and brought more attention to the issue, Attorney General Eric Holder announced that the federal government will no longer participate in civil asset forfeiture. Unfortunately, this announcement will only affect about six percent of forfeitures nationally. The for-profit prison industry is worth $70 billion. Private prison companies like CCA and The Geo Group approach cash-strapped states and offer to save them money by buying their prisons. However, evidence that private prisons save money is mixed at best. States pay a daily fee for each prisoner housed in a private prisons, and corporations set a number of beds (usually no less than 1,000) and an occupancy rate (usually around 90 percent) that states must meet or pay a fine for each empty bed. It is unbelievable that such deals are legal since they give states an incentive, other than crime, to keep people in prison. In order to increase profit margins, private prisons keep prisoners in less humane and less sanitary conditions. This leads to higher incidences of violence, and higher rates of recidivism in private versus state-run prisons. For-profit prison corporations also contribute to political campaigns and lobby states and the federal government to pass laws that will increase their profits. In the past 10 years, CCA has spent $17.4 million on lobbying. Between 2003 and 2012, it made $1.9 million in political contributions. The Geo Group spent $2.5 million on lobbying in the last 8 years and $2.9 million in political contributions between 2003 and 2012. They help to write laws that create more prisoners. Two key methods are criminalizing more activities and increasing sentencing. Remember the law in Arizona that said that people who "looked Hispanic" could be required to show law enforcement papers whenever asked? As NPR reported, ALEC (the American Legislative Exchange Council) and the private prison lobby wrote that law. Many of the laws they have successfully lobbied for aim not to deport undocumented immigrants, but to imprison them for long periods of time so that corporations can reap the profits. Nearly half of all immigrant detainees are currently housed in private prisons, according to a Huffington Post investigation. Detaining undocumented women and children while they await hearings was all but eliminated up until recent years. Under the Obama administration, the number of immigrants detained in inhumane conditions, mostly in private prisons, has skyrocketed. This is the result of failed policy. The War on Drugs has also created ballooning prison populations by increasing arrests for petty offenses (such as marijuana possession). America has the longest first time drug offense sentences (5-10 years) of developed nations. Research shows, however, that incarceration does not reduce crime because incarceration only prevents crime when a subject is locked up. Research shows, further, that the possibility of prison time does not deter crime before it happens and may actually encourage prisoners to commit more crimes once they are released as recidivism rates are astonishingly high. 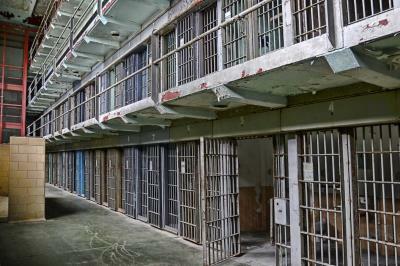 In actuality, prison creates a cycle of crime and imprisonment in impoverished neighborhoods. It's easy to dismiss the problem of profiting of off the prison industry because we all assume that we will never be in the prison system. But many of these issues affect innocent people who are only accused. And all of them affect us as taxpayers and as citizens who desire a just society.